Quite a few years ago, I returned to Scotland with my father and visited Loch Lomand. We were walking by the lake and these ducks were following us, looking for food no doubt. They struck me as so comical that I took their picture. Years later, my granddaughter, Rachel, wished me to look in the album for some pictures to share and I saw the photo with different eyes. 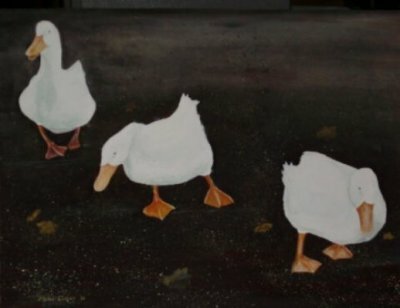 My daughter-in-law, Anne, had told me our Michael had his 'ducks in a row'. This painting, now in the collection of our friends, Ralph and Beverly Edwards, is very special to me.